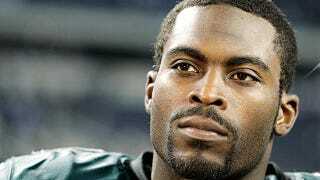 Yes, Michael Vick is black again. The weird white photo illustration has been replaced with the above shot. Commend yourselves, people of the blogs and Twitter. You've vanquished ESPN stupidity in record time. Who Does ESPN The Magazine&apos;s White Michael Vick Look Like, And Why Is He Here? PREVIOUSLY: Who Does ESPN The Magazine's White Michael Vick Look Like, And Why Is He Here?